What is Agency Cost and who bears them? An agency cost is a cost of reducing agency conflict among the owner/ principal (stockholders) and managers (agent). We can also say the cost which is bears by the company to reduce the agency conflict is basically known as agency cost and this cost must be maintained by the respective parties or by the company. To reduce agency conflict some effective measure can be taken which is cost worthy. Managers can be encouraged to act in the stockholders best interests through incentives, constraints, and punishments. But these tools are effective only if shareholders can observe all of the actions taken by managers. A moral hazard problem, defined here as a situation in which agents take unobserved actions in their own interests, arises because it is virtually impossible for shareholders to monitor all managerial actions. To reduce agency conflicts and the moral hazard problem, stockholders must incur agency costs, which include all costs designed to encourage managers to maximize shareholder wealth rather than act in their own self-interests. Opportunity costs which are incurred when restrictions, such as requirements for stockholders to vote on certain issues, limit the ability of managers to take timely actions that would contribute to shareholder wealth. Agency costs must bear by shareholders. In the absence of any effort whatever to affect managerial behavior, and hence with zero agency costs, there will almost certainly be some loss of shareholder wealth due to improper managerial actions. Conversely, agency costs would be very high if shareholders attempted to ensure that every single managerial action coincided exactly with shareholder interests. Thus, the optimal amount of agency costs to be borne by shareholders should be viewed like any other investment decision. What kind of agency conflict between shareholders and creditors may exist? A conflict between shareholders and creditors is common for the company which uses debt capital to form an optimum capital structure. Agency relation exists when one party works as an agent of the principal. In an organization, management works as an agent of owner or shareholders. When managers work for the company they can be influenced by the own interest so that they prefer their own interest rather than the interest of the company, on the other hand, creditors interest is to provide credit and get the principal amount and interest timely. For ensuring their credit return creditor always concerned whether the company is doing business in the right manner or not. By monitoring the financial performance of the company creditors actually, want to ensure their interest. So if there is any dispersion then creditors work to resolve the issue by taking necessary steps. On expectations concerning future capital structure decision. These are the primary determinants of the riskiness of a firm’s cash flows and hence its debt, so creditors base their required rates of return on these factors. Now suppose the stockholders, acting through management, have the firm take on a large new project that has a greater risk than was anticipated by creditors. This increased risk will cause the required rate of return on the firm’s debt to increase, which in turn will cause the value of the outstanding debt to fall. If the risky capital investment is successful, all of the benefits will go to the firm’s stockholders, because creditors’ returns are fixed at the old, low-risk rate. However, if the project is unsuccessful, the bondholders will have to share in the losses. Agency conflict is a common problem we face in an organization, this problem arises because of the difference in the interest of management, owner, and other related parties. An agency relationship arises whenever one or more individuals hire other individuals to perform some service and also delegate decision making authority to the agents. Here the hiring parties are principal and hired individuals are the agent. But the question is what is agency conflict? A potential agency conflict exists whenever a manager owns less than 100 percent of the firm’s common stock. If the firm is a proprietorship business then the manager is the owner, the owner-manager will take actions to maximize his or her own welfare, or utility. The owner-manager will probably measure utility primarily by personal wealth, but other factors, such as leisure time and perquisites, will be considered. However, if the owner-manager sells some of the firm’s stock to outside investors, a potential conflict of interest, called an agency conflict, arises. For example, the owner-manager may now decide to lead a more relaxed life and not work as strenuously to maximize shareholder wealth because less of this wealth will accrue to him or her. Also, the owner-manager may decide to take more “business trips” to fun locations because some of the cost will now be borne by the outside shareholders. In most large corporations, potential agency conflicts are quite important, because managers generally own only a small percentage of the firm’s stock. In this situation, shareholder wealth maximization could take a back seat to any number of possible managerial goals. 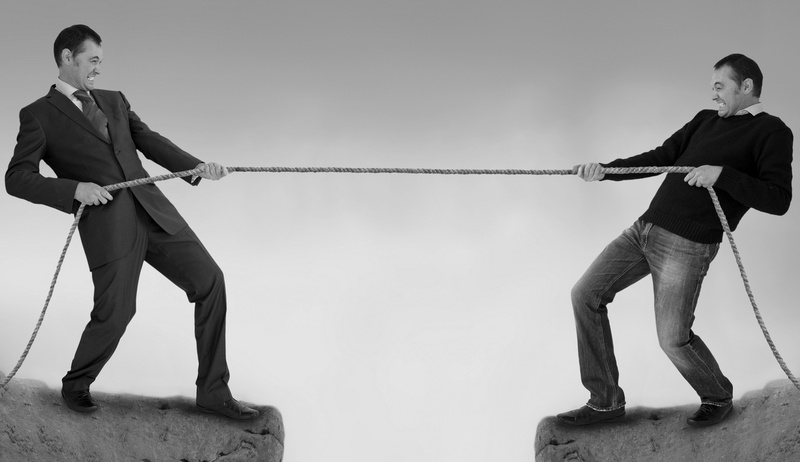 In an organization, an agency conflict may always be there but it is owners responsibility to reduce agency conflict as much lower level as they can. Question may arise in your mind that what is a bond. A bond is a financial instrument used by the government or corporations to collect money from the market. It provides a fixed benefit to the bondholders periodically and also at the time of maturity. Although the use of bond as a financing instrument used in developed countries and is very popular around the world. But in Bangladesh the use of the bond not getting enough popularity yet. By selling a bond, borrowers make a contract with the buyer to pay interest and principal at the time of maturity. All provisions, terms & conditions are written in the bond indenture. A bond indenture is the written document where all terms are clearly mentioned which actually helps to ensure the right of the bondholders. Basically, a bond pays interest semi-annually to the bondholders at the specific rate which is mentioned in the bond indenture. Bonds with the maturity of 10 years or more are considered as long-term bond. The interest of bond is set on the basis of market interest rate. 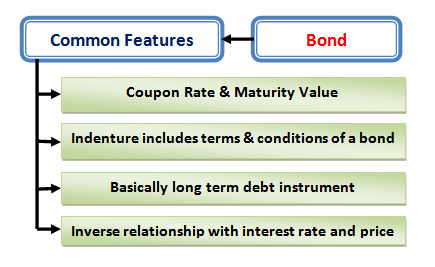 Every bond has coupon rate (except zero coupon bonds), maturity date, and face value (basically Tk 1000). Some may have call provision and convertible features. There is an inverse relationship between interest rate (market interest) and the price of the bond. Higher the interest rates lower the price of the bond and vice versa. We get the price of the bond by discounting the cash and capital gain received from the bond by the required rates of return. Normally large companies issue a bond for the purpose of collecting long-term funds from the market. Bond is a long-term financial instrument issued by the large companies to collect long-term funds. Every bond must have a face value, maturity value, and coupon rate and maturity period. It provides periodical benefit to the holders (basically for an interval of six months). The terms and conditions are written in the bond indenture. Zero coupon bonds do not provide any coupon/interest. It provides benefit at the maturity where the bond is issued at discount. There is an inverse relationship between interest and price of the bond. The callable or convertible feature is common for a bond. Actually, the characteristics of a bond are depended upon the types of a bond which is being issued and where it is issued. Country to country the type and features of the bond vary. 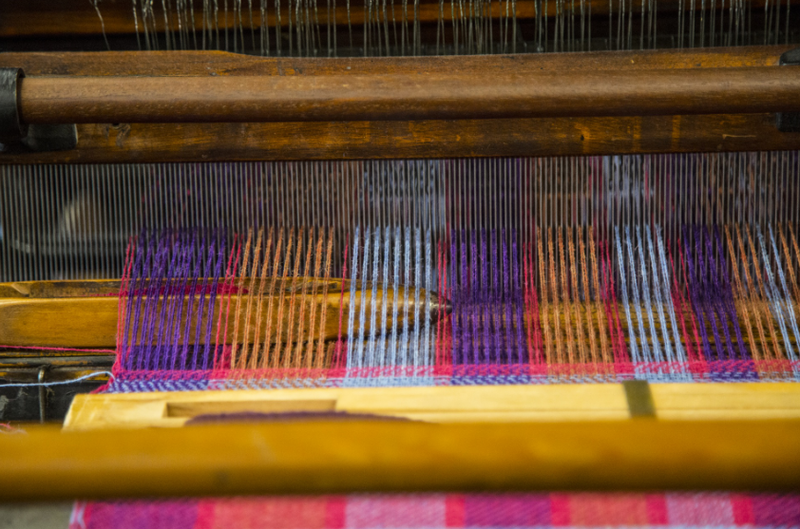 Whether you are a textile engineer or a student of textile going to be graduated soon, you may have many confusions in your mind that from where you can start your career. The expectation of getting a job for developing career varies from person to person. But remember one thing; you can start your career by joining any department of textile sector. After that, you can rotate your career and enrich your knowledge of different departments. There are lots of people who didn’t have any educational background in textile but they are doing well. Question is how they are doing better day by day; you can get the answer if you observer their motive of working, they have the capability of learning through working. 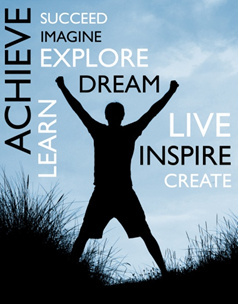 Positive motive towards work actually brings success in career. So why are you waiting for? You can read get the core knowledge of textile. All you need to keep patience learn & apply your knowledge, one day you will get what you are looking for. Make sure that products are produced on time with good quality. Reviewing worker performance and identifying training needs. Working with managers to implement the company policies and goals. If you like this article then please do not forget to leave your valuable comment in the comment box. There are lots of weaving factory in our country. So, it’s very important to know about the calculation of weaving cost calculation. So, today I am presenting a sample calculation of weaving cost and profit. Knitted fabrics provide comfortable wear to almost any garment. For making comfortable wear we first think about knitted garments. Though it has an open structure so most of the knitted garments contour to the body’s silhouette. That’s why knitted garments are so much popular as inner-wear, bodywear, and sportswear. There are basically two types of knit fabrics. 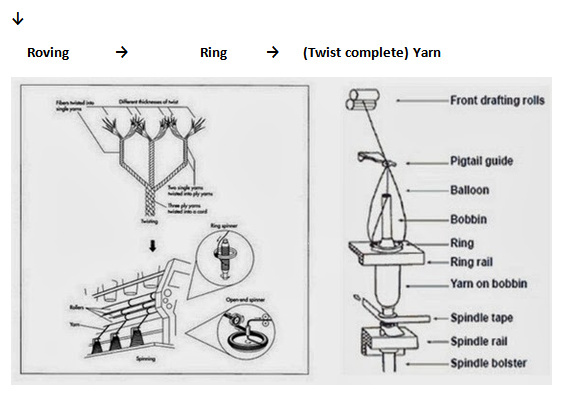 Weft knitting is the simplest method of converting a yarn into fabrics. 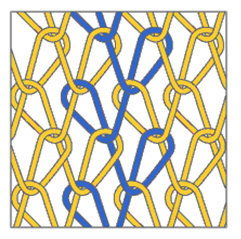 In weft, knitting loops are made in a horizontal way from a single yarn. In this way, inter-meshing of loops take place in a circular or flat form on a crosswise basis. Most of the weft knitting is of tubular form. In warp knits yarn zigzag along the length of the fabric. 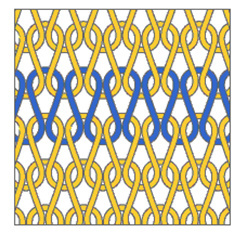 In warp knits the number of stitches in a row is equal of the number of separate strands of yarn. It is almost done by machine, not by hand. 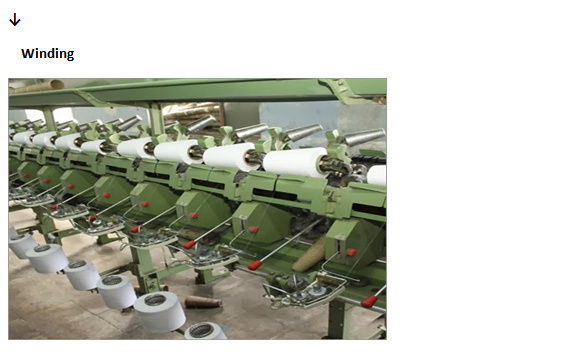 Tagged Types of knitted fabric, Warp knits, warp knitting, Weft knits, weft knitting, what are the types of knitted fabric, what is diversifiabe risk, what is finance, What is knitted fabric? 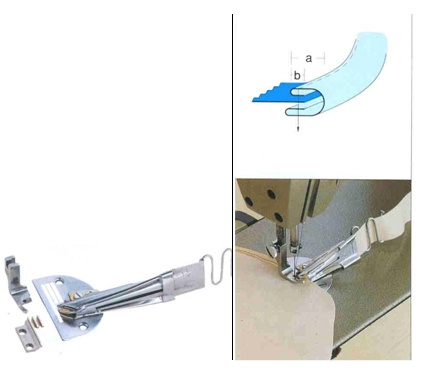 A folder is an attachment to a sewing machine for bending and folding the fabric previous to sewing. It belongs to the category of work aids (Additional devices that can be added to basic sewing machines)generally used in situations where fabric must be fold prior to sewing. Can be used for folds ranging from simple to complex. Different types of folders available in different size and thickness. The thickness of the folder is selected depends on the type of fabric. It helps to improve the productivity. Improve or maintain quality standards. Reduce training time of operator. Reduce fatigue of the operator. These are some types of folders used in the garment industry. 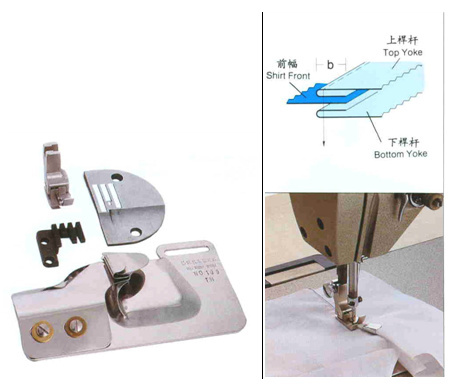 It is excellent for continuous hemming on automatic sewing operations. 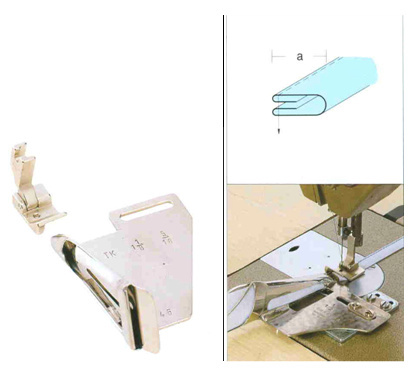 It’s suitable for double needle lockstitch machine. Used to make narrow hems, on prior to ruffling, curtains, and other straight hemming operations. 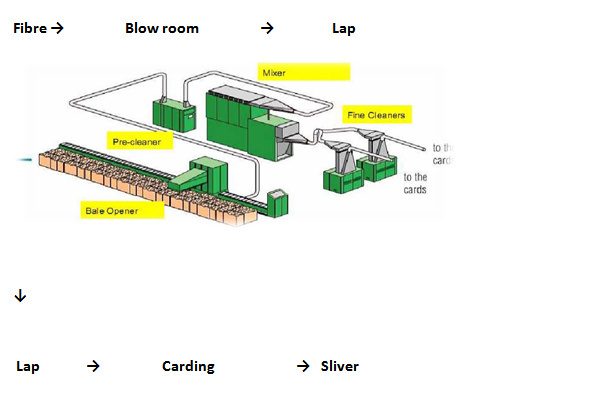 Output piece seam line diagram is shown in the image. 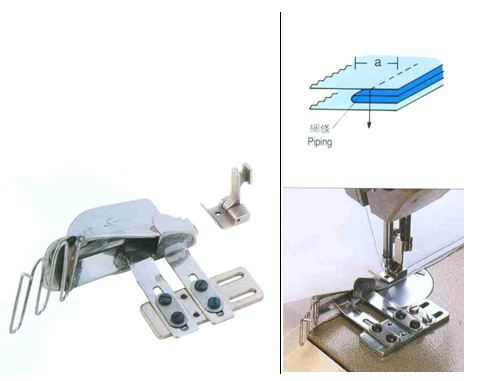 It is used for sleeve attaching operation by using a single needle lock stitch machine. 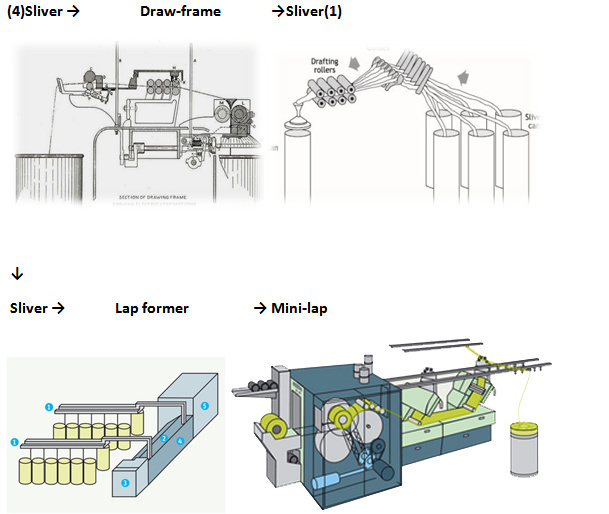 Output piece seam line diagram is shown in the image. It is used for preparing piping seam by using a single needle lock stitch machine. 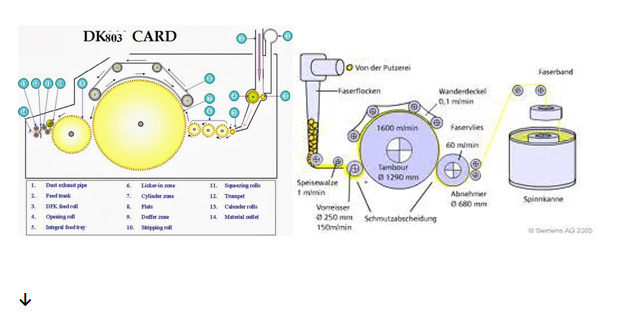 Output piece seam line diagram is shown in the image. 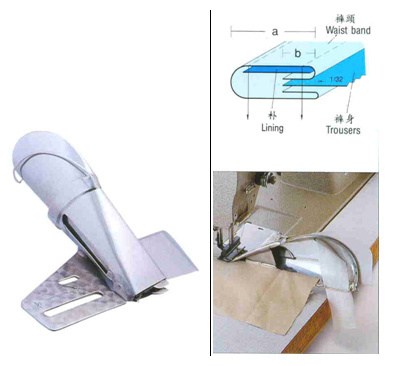 It is used for preparing belt loop by using a single needle lock stitch machine. Here stripe of fabric inserted on the folder. Output piece seam line diagram is shown in the image. It is used for cover the raw edge by using a single needle lock stitch machine. Here stripe of fabric inserted on the folder. It binds the fabric edge evenly. Output piece seam line diagram is shown in the image. 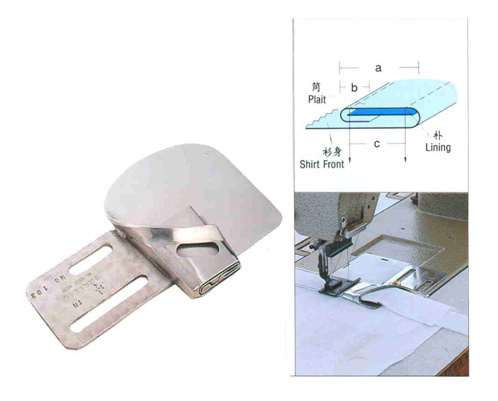 It is used for attaching waistband by using double needle lockstitch machine. It binds seam on the waistband. Output piece seam line diagram is shown in the image. 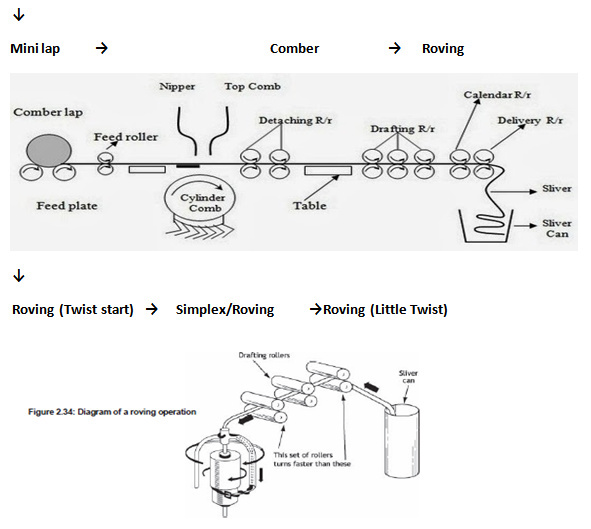 In this article, you will have details idea of a spinning process because we present all the process sequence in a visual flow chart of spinning.